For a course on 'Designing Technology to Counter Violent Extremism', my team focused on the cultural integration of new immigrants and refugees. I carried out an extensive user research to understand the needs of our target population and help our team pick the most impactful technology for the purpose. 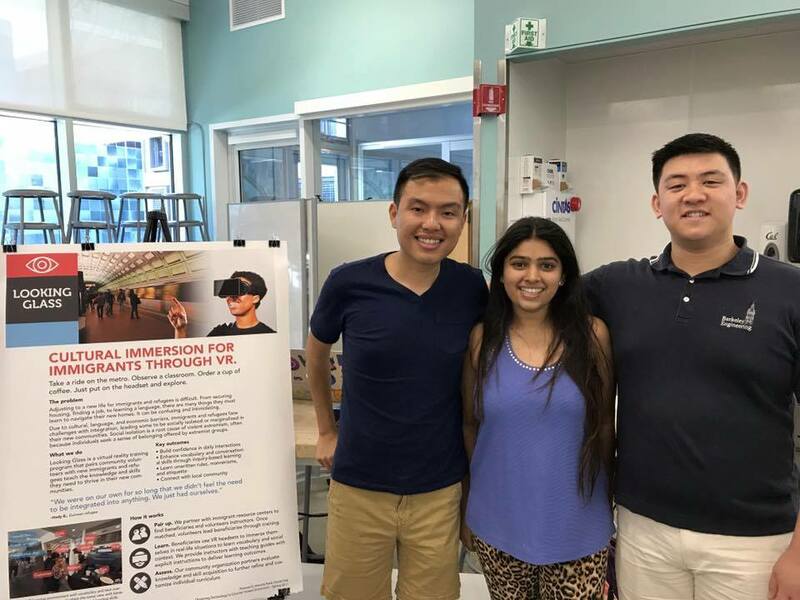 My team's final product was Looking Glass, a Virtual Reality training program that pairs community volunteers with new immigrants and refugees to teach the knowledge and skills they need to thrive in their new communities. Cultural, language and economic barriers lead to social isolation for these marginalized communities, which is often a root cause of violent extremism as individuals seek a sense of belonging offered by extremist groups. Our product aids immigrants to adjust to a new life by helping them learn to secure housing, find a job, learn a language and navigate their new homes. Here is a walk through of the user research process I went through. I started by conducting interviews of various stakeholders such as peer advisors, community leaders, attack survivors, refugees, local resettlement centers, etc. to understand the problem of social isolation, know about the existing help and infrastructure available and run through some of our potential ideas. Across 4 months, we interviewed over 100 stakeholders in-person, via phone-calls, video-chat and emails. Since our entire team was located in Berkeley, our interviewee sample population was highly skewed to people and organizations in the Bay area and California. We also used a lot of personal contacts to get in touch with experts and extremism victims. I summarized the insights from the stakeholder interviews to come up with the How Might We questions. How might we engage with local communities to provide support and services to at-risk individuals? How might we intervene during the aftermath of an extremist attack to reduce marginalization and build more cohesive communities? Here's one of the several stakeholder maps I created. The size of the icon of a stakeholder emphasizes on their importance and influence on the muslim immigrant. How effective is watching a 2D video at familiarizing someone with a foreign environment? Our hypothesis: Exposure to a space, even through a digital medium, can increase perceived comfort and familiarity with a space. Participants surveyed about their familiarity with a place, shown a video about it, and then subsequently surveyed again. How much do people explore when presented with an immersive environment, and do they ask questions? Our hypothesis: Immersive environments can teach observation, inference, prediction, and pattern-making skills that will help newcomer immigrants and refugees acclimate to their new communities. Participants given a phone with static 360 image of an environment, participants encouraged to explore and ask any questions while experimenter asked them questions about being and acting in the space. People initially take some time to overcome the novelty of the technology, but tend to interact more later. We attended an Intro to Backpacking workshop at REI to see an example of teaching someone about a new experience they could have before they actually experience it in person. Participant meets with experimenter A and roleplays two interactions. Experimenter evaluates performance in confidence and correctness. Participant meets with experimenter B and engages in a training session. Participant meets with experimenter C and roleplays two more interactions. Experimenter evaluates performance in confidence and correctness. Goal: Determine if training improves confidence and clear communication using social norms. Participant meets with experimenter A and engages in a training session. Experimenter has a list of explicit learning goals. After a couple days, participant is sent a quiz with images from a similar, but not identical environment and asked about tasks. Goal: Determine if this method of training is conducive for retention. Assumption: Short term retention leads to replicability in physical environments. Self-reported well-being – survey beneficiaries about feelings of social isolation, new friends made, outlook on future, etc. Looking Glass was created as part of Designing Technology to Counter Violent Extremism, a course offered by the Jacobs Institute for Design Innovation at UC Berkeley and the Department of Homeland Security.